Making sourdough bread is the simplest way of making bread. Believed to have originated in Egypt, where it just so happened that the grains they grew and milled behaved magically with the yeasts in the air, sourdough bread has come to the forefront of modern day bread connoisseurs. 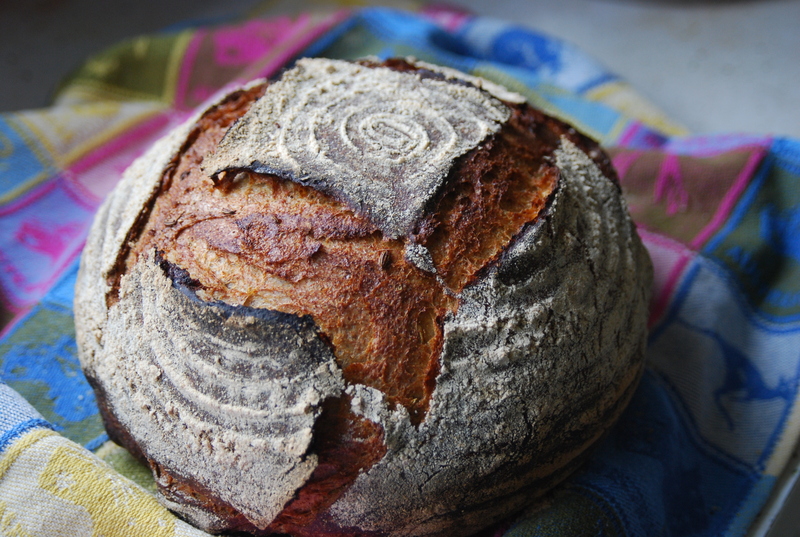 My next sourdough workshop is planned for the weekend of October 25/26. Click on the link at the bottom of this page, to book. Find out about my Sourdough Workshops by clicking here. See photos and feedback from the August 9/ 10 workshop here. 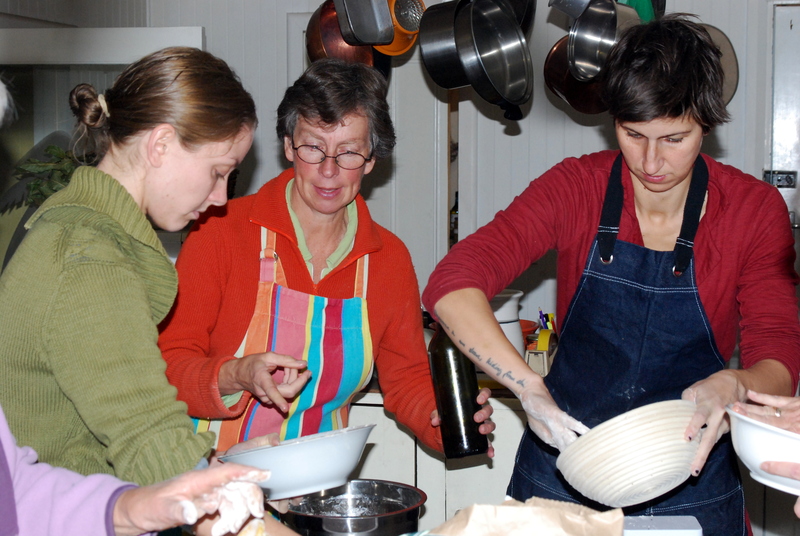 You can read feedback from recent participants and see more photos by going to Sourdough Breadmaking. You can book for this workshop by going to this link. October in Tasmania usually means beans. Bush beans and climbing beans are a very nutritious and easy to grow crop. You can even get artistic with your frame for the beans to climb on. If you have a problem with grass in your garden beds, sow your seeds in trays. Don’t forget October is also a great month to start herbs. Hey! Hey! Hey! Spring is here now! LSA (Linseed, Sunflowers and Almonds) is a seed-meal supplement often recommended by natural health practitioners. It’s an excellent source of omega 3 oils, amino acids, vitamins, minerals, and fibre. The benefits of LSA are not just in what it provides, but what it reduces. Almonds lower the glycemic index of accompanying foods, for example. The vitamin E and selenium in sunflower seeds will help neutralise destructive ‘free radical’ molecules, and the omega oils in linseed have anti-inflammatory properties and can help in healing a range of degenerative conditions. LSA is used to cleanse and detox the liver. The liver is the cleanser and filter of the bloodstream, and it regulates fat metabolism. The liver makes HDL cholesterol (good cholesterol) which acts as a scavenger and carries the LDL (bad) cholesterol back to the liver for processing. The liver also secretes bile which breaks down and removes excess and unwanted fat from the body. We recommend that you use one to two tablespoons per day of LSA. LSA can be added to your morning cereal, to yogurt, smoothies, or any recipe just to increase its nutrient value. It can also be sprinkled on salads and fruit. At The Garden Shed and Pantry, we take the making of LSA (and your health) very seriously. Firstly, we use materials that are either certified organic or come from farmers who grow their products without the use of chemicals. Secondly, we only make enough supplies to fulfil customer orders at the Cygnet Market (and it is usually made just a day before the Market). 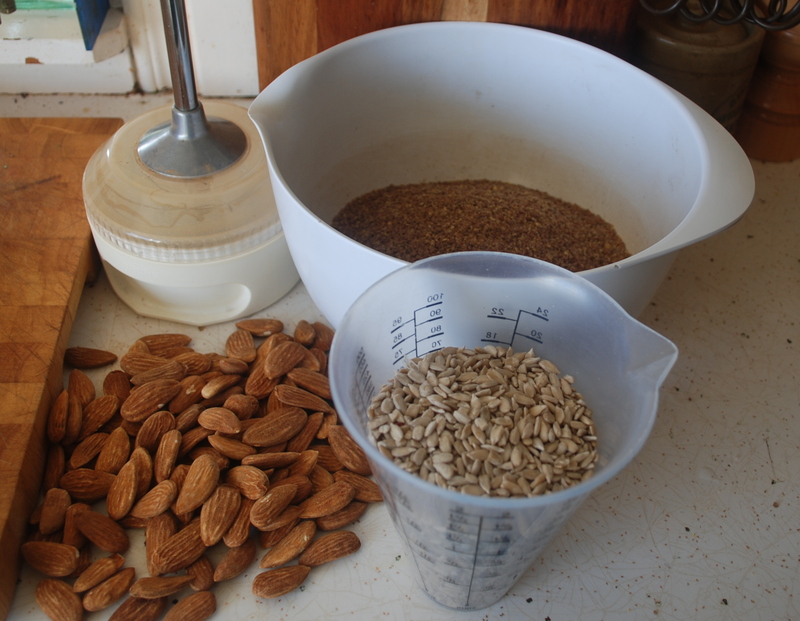 We use Four Leaf Organic Sunflower seeds and Linseed and we use Johnston Almonds (the best tasting almonds in the world). Leftovers (if any) go on our breakfast, and are not kept to sell at a later date. 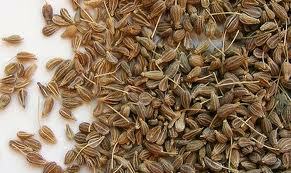 The aniseed plant, pimpinella anisum, is native to the Mediterranean region and Southwest Asia. Both the seeds and leaves have the distinctive taste, but it is usually only the seeds that are used. Aniseed is often used to flavour baked goods and savoury broths. The flavour has similarities with other spices such as star anise, fennel and liquorice. Despite its near worldwide cultivation, aniseed remains most popular in recipes from the Mediterranean region. It is very common in baked goods such as breads, cakes, and biscuits; the slight sweetness of the herb adds a complexity and interesting dimension to otherwise more “ordinary” recipes. Many cooks will also add it to soups, stews, and savoury sauces for similar reasons. The herb tends to open when simmered, which can release many of its essential oils. The result is often an intricately flavoured meal that does not require much effort on the part of the cook. Aniseed is also the predominant flavour in a number of Mediterranean liqueurs and is widely used in a variety of regional and ethnic confectioneries. The Greek drink, Ouzo carries its distinctive flavour, as do the Italian Sambuca, the French Pernod, and the Turkish Arak. Most of these are served as cordials and after dinner drinks. 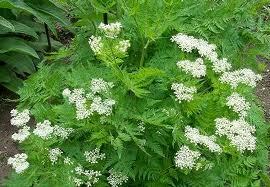 In addition to its use in cooking, aniseed also has a long history as a medicinal herb. The ancient Romans thought the plant promoted better sleep, and the seed is still used in herbal teas for this purpose. The oil and sometimes the seeds have also been used by a variety of cultures to help with digestive problems. This may be part of the reason why drinks like Ouzo and Sambuca are popularly consumed after large meals. Get these and other fabulous fresh spices from the Cygnet Market or at the Garden Shed and Pantry. Check out the newly renovated pantry and the special Spice offer. Spring has arrived and now is the time to think about getting out in the garden. The Garden Shed and Pantry has a great range of products to assist you in the garden. 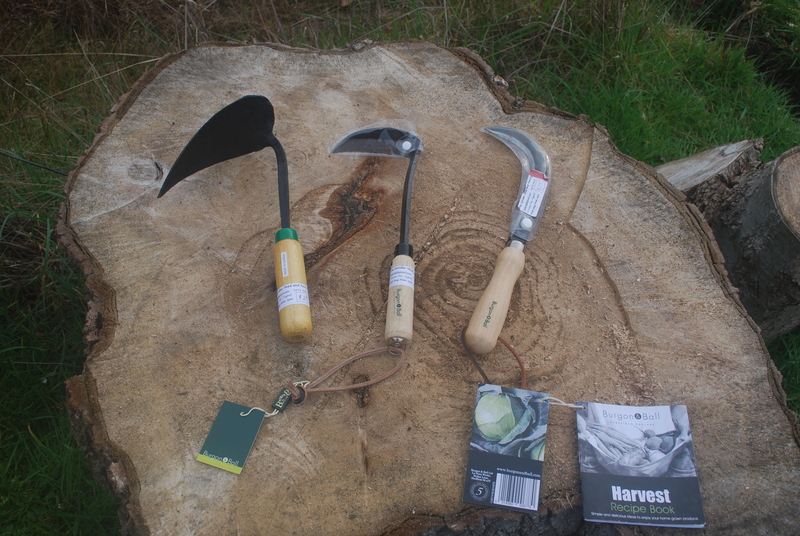 The Korean tool, the Ho Mi, is the perfect tool for small scale digging, weeding and sowing seeds. It’s a very popular product and so it should be. It has been in existence for 1000’s of years virtually unchanged. We also have Harvest Knives and Japanese Razor Hoes. We have the ideal ladies spade. The spade is made by Burgon & Ball, English manufacturers since 1730. It is a light but robust spade for all general digging – ideal for planting in borders. It has a polished, double riveted ash handle for comfort and long life and has an extra long strapped socket which provides strength and flex. As you would expect, a high quality product like this has a ten year guarantee. This is a lifetime gardening investment. Of course, we have the best book for the Tasmanian vegetable gardener. Steve Solomon is a renowned authority on how to get the best from your soil and we have sold heaps of his book,Growing Vegetables South of Australia, over the last few years. This should be the first book you purchase if you are serious about growing food in your garden. We have other gardening books too. The Environmentally Friendly Useful Garden Kneeler is just the thing for early spring when the ground is still very damp. It’s also useful in summer when the ground can be quite hard and tough on the knees. 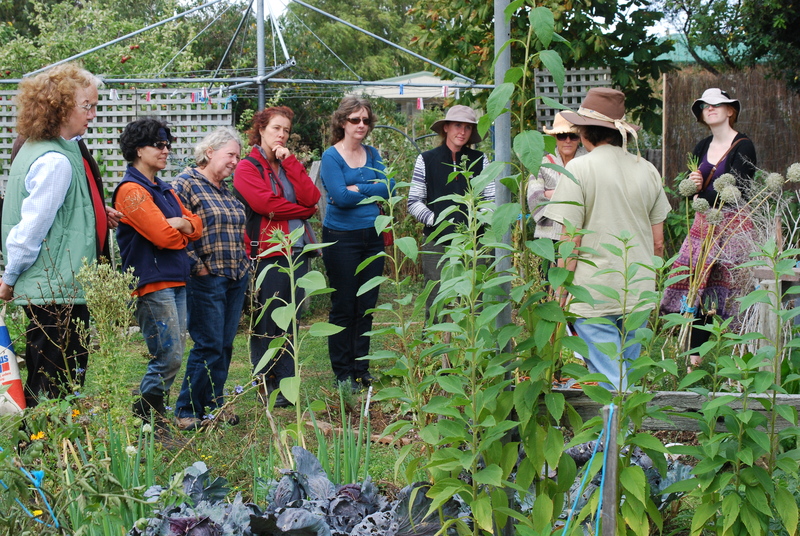 Help support the Cygnet Community Garden and buy a kneeler for the gardener in your life. Spring wouldn’t be Spring without seeds and flowers. 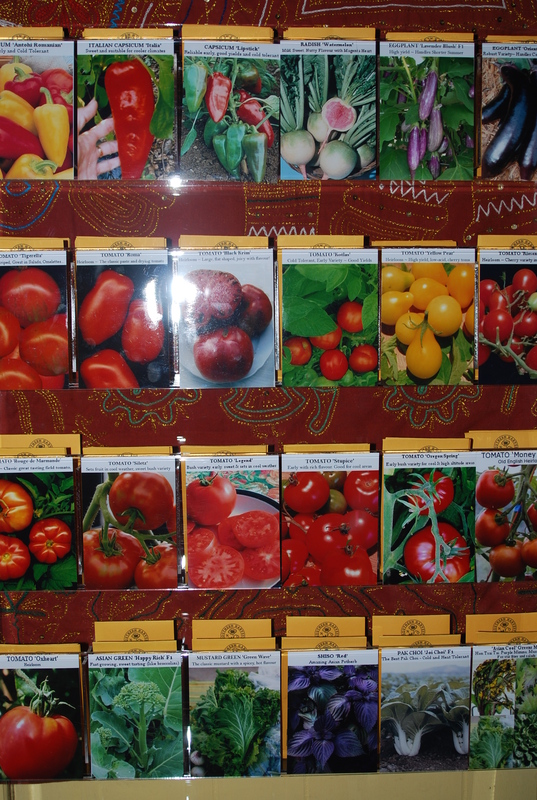 At the Garden Shed and Pantry, we stock a range of vegetable (and herb) seeds from Southern Harvest that are selected by Kate and Seedsaver Sam specifically for sowing now in Southern Tasmania. Each month we select the right seeds to be sown. All you have to do (almost) is come and choose your seeds and go home and sow them. You can also order native and cottage garden seeds through us. 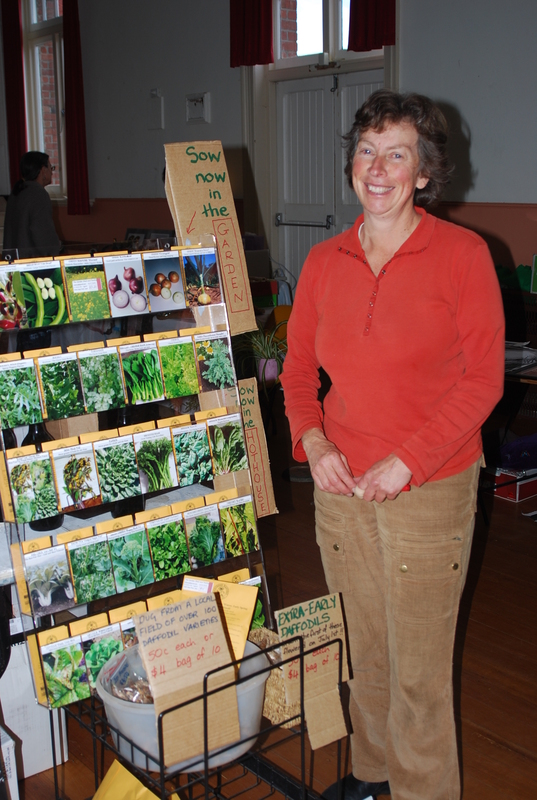 Don’t forget that we have a monthly seed sowing guide to assist you with your seed sowing. Once you have your seeds in the ground or in a pot, you will need to water them – we have the seed mister for that task. A beautiful and exquisitely made product that generates a light mist designed to provide moisture but not a deluge which can damage your young seedlings. Complete Organic Fertiliser (COF) mixture contains many ingredients such as kelpmeal, high-phosphate guano and various agricultural limes plus seedmeal etc. Some of these ingredients are not easily obtained in smaller quantities or at an affordable price. We have decided to purchase all of the ingredients required to produce the COF mixture. We sell the mixture in small bags (approx 9 litres) which is suitable for an average garden (approx 20 sq metres, or 4 beds, 5m x 1m) or in a large bag (approx 36 litres) which is suitable for the keen gardener and larger areas. You can read more about COF mixture in Steve Solomon’s book, Growing Vegetables South of Australia. We are always on the lookout for new products that will assist the gardener and we think we have come up with something that you might just like. A trug is the essential garden accessory – whether its for gardening tools, freshly picked fruit or flowers, this is the ideal present for the gardener who needs something more. For the budding gardener, we have smaller trugs, just like mums but not too heavy and just perfect for smaller gardening tools or flowers. 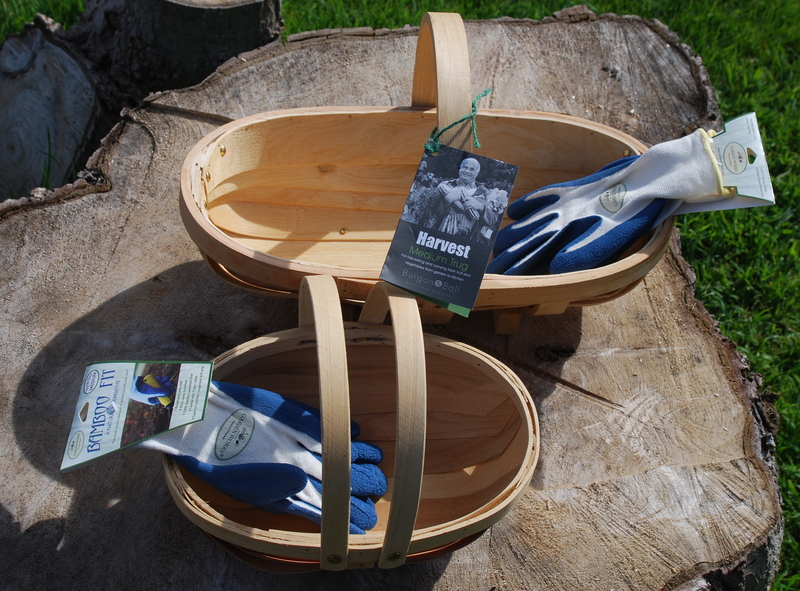 We have also taken delivery of a new range of super comfortable latex and bamboo gardening gloves. Check them out when you visit next time. The Cygnet Market can get quite frantic at times. Sometimes we are serving customers and others are waiting to be served. There are times when the stage seems to be packed full of people browsing our wide range of products. 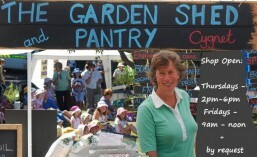 Come along to the Garden Shed and Pantry to view our range of spring gardening needs or to ask for gardening advice. Pictured below is the eighth winner of the GaSP! 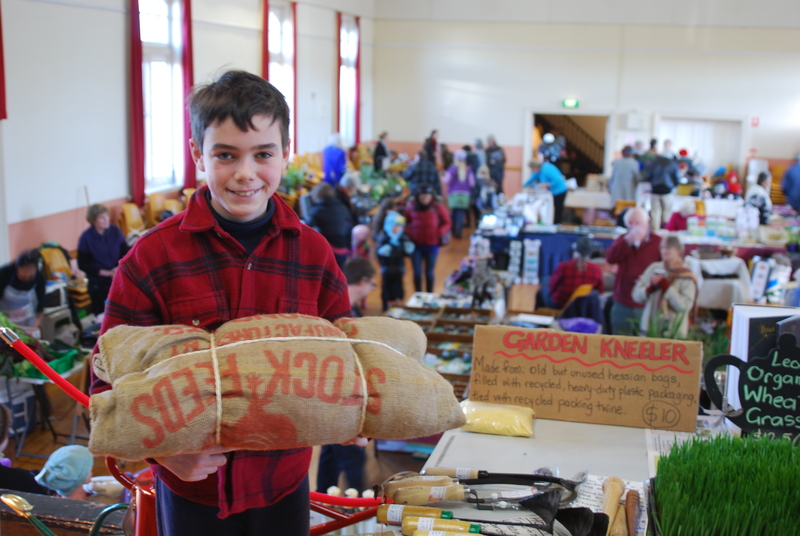 Take 10 voucher from the September 15 Cygnet Market. 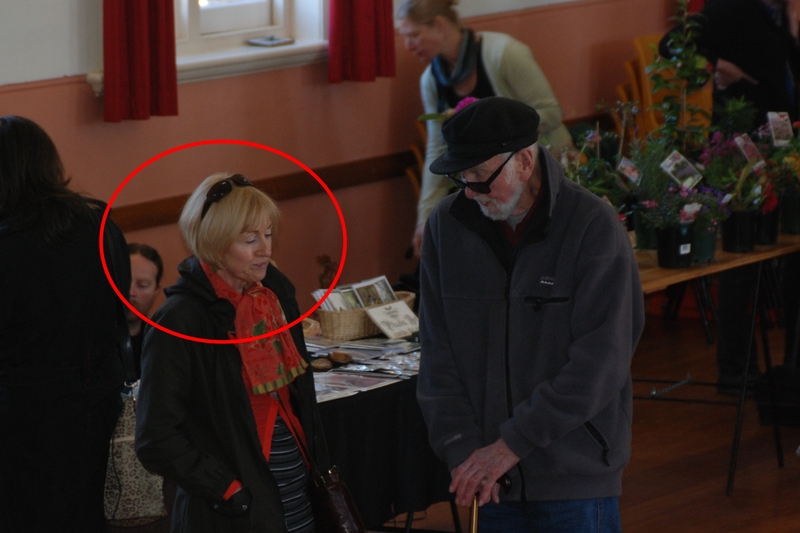 The person highlighted below will be entitled to ten percent discount off their next purchases from the Garden Shed and Pantry prior to the Cygnet Market on October 20. If you know the person pictured, please contact them and let them know they are a WINNER!! The winner should email us here to claim their prize.